It is interesting that a joke, crude and very local, should nudge my spirit to start writing this column. When two daughters of Simon Lamb visited the market, the one from the great land of the diaspora (note: accent, emphasis on the ‘i’, not the ‘o’,) should point to the great fruit mami, (accent on ‘a’ and ‘i’) if she wants to be an authentic Belizean. The diasporan’s correction “oh, you mean ‘mother’”suggested to me that the fruit really reminds you of mother’s breast, so much so that we call it mami. Remember accent on both the ‘a’ and the ‘i’. The incident merits mention because it elicited from me the connection I have with the original diaspora and how I came to be who I am. My maternal grandfather came to Belize at a very early age; family legend places that arrival at about fifteen. This is about the time in Europe when the first Great War had been fought and an unknown corporal of the German army started to make Nazi noises. Aldous Hurley had visited British Honduras and had declared that if the world had an end B.H. would be it. I believe that if you were a Jew and had a son the safest place to hide him would be that place that the wise Englishman had pronounced worthy to be forgotten. That young man met a dainty Mestizo, Luisa Bareido. They had six children, all daughters; Francisca, the youngest, survived her mother in the ordeal of childbirth. She was my mother. The foregone lines may be too long an introduction to tell you why I have chosen Janus II as my nom de plume. 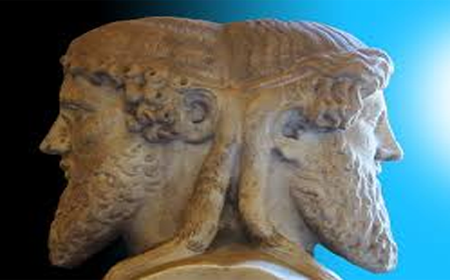 As you already know from Janus I, Janus was the Roman god of beginnings and ends; he looked forward and backward. You may want to know why a person committed to Christian beliefs and values should pay any respect to a pagan god? Perhaps by reading in Greek culture of how Socrates was accused and condemned for being atheistic, I learned that he was skeptical instead, refusing to accept that a god could have the same weaknesses of man. When I consider the man CB Hyde, I realize that our differences are but superficial, what would be called in Aristotelean and Thomistic philosophy accidental, not really essential qualities of what makes us who we truly are. There is that substance of both of us and potentially every human being, that enables us to declare: my friend and I are the same. This is the great secret of what we call Western Civilization. Its values are what give me the great insight to look beyond the differences of looks and behaviours that Africa, Asia, Europe and the Americas have seared into our skins. These marks will one day completely disappear when we will have developed the skills needed to know and understand by looking from the inside to the outside instead of emphasizing what the eyes see and assigning the greatest values to those accidents. In the foreword of the Sixth Annual Report of the Ombudsman of Belize to the National Assembly of Belize, he wrote, “The framers of the Constitution of Belize, like the architects and engineers of an historic, monumental edifice, pointed to the timeless truths concerning the real origins of humankind and the enduring principles which must guide human behavior and actions if they are to live peacefully and fruitfully in this space that we call Belize and achieve that quality of life and culture to which we all aspire. Janus, in deed and in word, has shown how much he values Western Civilization. I honor him! He deserves many of the highest degrees in the sense we call COMMON.